Now that summer is over, I've been looking for a safe, natural bronzer for my face and body to help keep my bronze glow through winter. LucyB Organic Bronzing Shimmer Oil is my new favorite multi-tasking, organic beauty product that hydrates my face, body and hair, leaving it with a beautiful bronze glow! Leave those harsh chemicals at the door and add some organic products made with love to your beauty routine. No need for self tanners with nasty, toxic chemicals that go right into the bloodstream. Not to mention the expense of buying separate products for your face and body! This amazing organic bronzing oil does it all and who could ask for more?! Here is my review on this natural, multi-tasking beauty wonder. 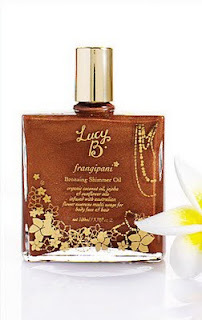 Lucy B's Frangipani Organic Bronzing Shimmer Oil is made with organic coconut, jojoba and sunflower oils, treating your body, face and hair to a sun-kissed, bronze glow. Infused with LucyB's confidence enhancing Austrailian Bush flower essences, the smell is amazing and I just can't get enough! I love this oil because it's so hydrating and leaves a beautiful, bronze glow that I can use on my face, body and hair with a slight shimmer that is just the right amount without looking glittery. The bronze color is the perfect tan color and looks 100% natural and a little bit goes a long way! What's more, you can use it in your hair, leaving it with a beautiful shimmer, shine and silkiness. LucyB Bronzing Shimmer Oil is used by celebrities, make-up artists and organic beauties. To get yours, please visit: Organic Beauty Now. Organic Beauty Now has a well curated selection of natural skin, body, and fragrance products along with the best in organic makeup and natural hair products. It's your one-stop shop for getting green and glam! Organic Beauty Now also posts expertly sourced natural beauty tips, tricks, and news.